This oversight hearing will focus on the access challenges faced by Border Patrol agents on federal borderlands and the environmental impact of illegal border crossings and drug smuggling. 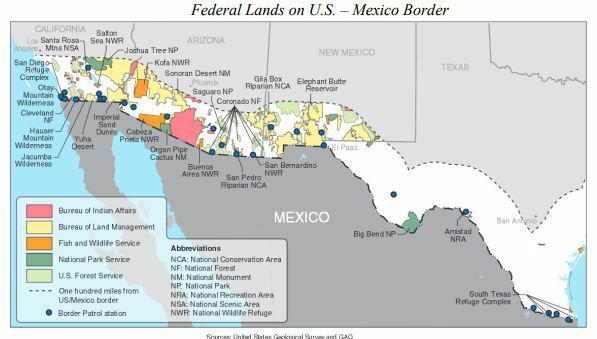 The remote location of large portions of federally owned borderland make them a popular location for cross border violators (CBVs), such as drug and human smugglers, foreign nationals, and terrorists and terrorist organizations. 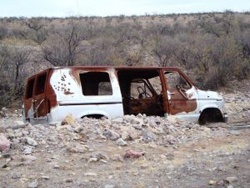 Many stretches of federally owned borderland have minimal security infrastructure and poor roads, making it difficult for Border Patrol agents to effectively patrol dangerous terrain. Environmental laws and varied jurisdictional responsibility among land management agencies further complicate border security efforts. Although a 2006 Memorandum of Understanding (MOU) executed by the Department of Homeland Security (DHS), the Department of the Interior (DOI), and the Department of Agriculture (USDA) intended to facilitate cooperation and communication between agencies, its practical effects can restrict Border Patrol’s security efforts. For example, approval processes per the MOU can take months, robbing Border Patrol the necessary operational flexibility and access to effectively respond to evolving CBV routes and drug cartel operations. While Border Patrol agents must balance environmental concerns and law enforcement access to protect our borders, CBVs and their accomplices completely disregard our natural resources and environmental protection laws. Cross border violations on federally owned borderland cause extensive ecological and environmental damage. 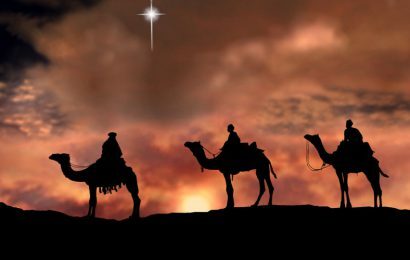 Illegal migrants, human traffickers, and drug smugglers, whether crossing by foot or using vehicles cause substantial damage to the natural and cultural resources found on federal lands. Tremendous amounts of human waste and garbage are left on borderlands every year. 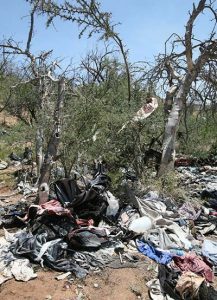 Medical supplies, diapers, clothing, and even broken-down cars are all left behind on federal borderlands. 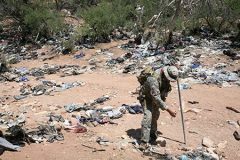 Throughout the borderlands, trash strewn lay-up points, staging areas where illegal immigrants and smugglers discard waste in preparation for being picked up by vehicles, are a common sight in dry river beds and washes. 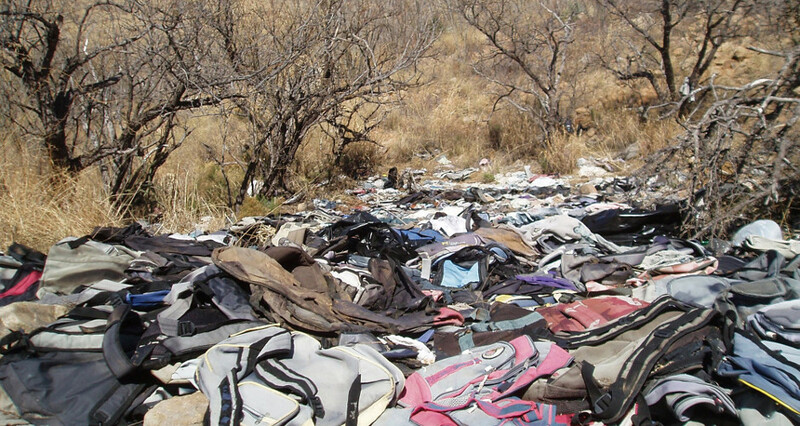 one of the major contributors to pollution in the San Pedro River, where volunteers cleaned up more than thirty temporary camps set up by CBVs in 2008 alone. CBVs are also responsible for man-made wildland fires started on the border. 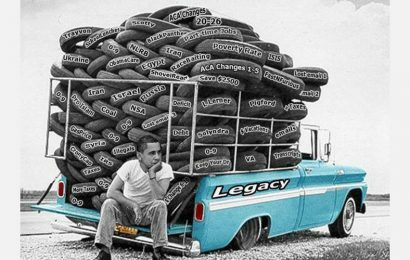 According to the Government Accountability Office (GAO), between 2006 and 2010, illegal immigrants and drug traffickers were likely responsible for 30 out of 77 investigated wildland fires on federal lands. High levels of CBVs complicate fire suppression efforts and forces firefighters to change tactics. For example, nighttime firefighting activities may be reduced due to firefighter safety concerns of encountering armed drug and human traffickers. Moreover, coordinating aerial firefighting operations along the border is more difficult because CBVs often use the same radio frequencies as firefighters. significantly impacting the natural quality of wilderness character . . .” through erosion, changing plant distribution, destruction of wildlife habitat, and soil compaction. Given the environmental threats of CBVs, FWS recommended increasing personnel and horse patrols as well as deploying more technological assets in Cabeza Prieta. EL PINACATE BIOSPHERE RESERVE, Mexico Drug traffickers scar volcanic desert with illicit runways, while law enforcement officials chase them through once-tranquil parks. Thousands of migrants traipse across delicate backcountry areas sending campers fleeing to ranger stations, fearful of crowds trekking by their tents in the night. Wilderness areas on both sides of the U.S.-Mexico border are taking a beating from an onslaught of migrants, drug traffickers and law enforcement officials, a new study says. Some national treasures in both countries have been lost forever. Few parks have taken a greater toll than the U.N.-designated biosphere reserve El Pinacate and Arizonas adjoining Organ Pipe Cactus National Monument. Last year, officials caught 200,000 migrants and 700,000 pounds of drugs in Organ Pipe alone. Last month, Pinacate and Organ Pipe officials completed the borders first environmental impact studies of illegal activities. The findings were eye-opening: It could take 20 years to recover from the damage, while some archaeological sites are gone forever. 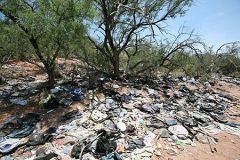 The collection and disposal of waste in remote areas along Arizona’s 370-mile border with Mexico poses difficult challenges. 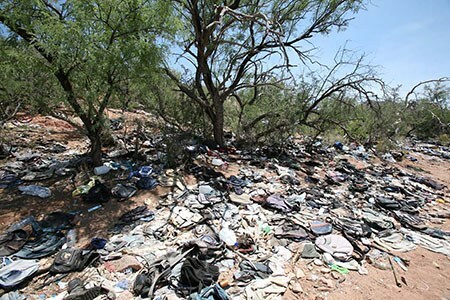 An estimated more than 2,000 tons of trash is discarded annually in Arizona’s borderlands. 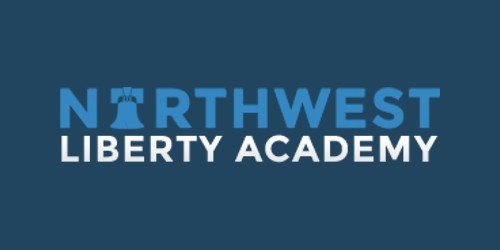 A variety of federal and state government entities, Native American tribes and private landowners are affected by the problem, and addressing it requires extensive coordination. 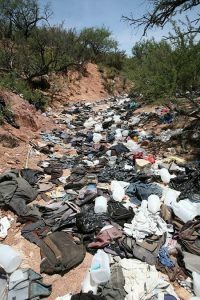 The environmental impact caused by illegal immigration, and the trash left behind, is increasingly being found in areas that are more fragile and remote. Desert Invasion U.S. has used photographic and anecdotal evidence to document the terrible environmental and human destruction that has resulted from the open-borders policies of recent years. 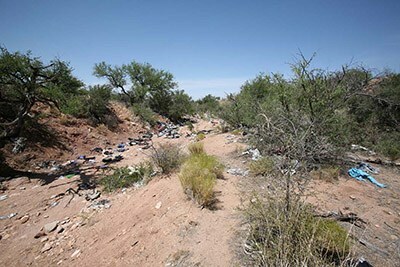 The environmental impacts have come from the trampling of vegetation, desert soils, pollution of springs and seasonal streams, and tons of garbage left by illegal immigrants consisting of plastic containers, tarps, backpacks, clothing, human waste, drug paraphernalia and other forms of trash. The website features an article by Ed Ashurst, an Arizona rancher whose property is on the border, which details the kinds of destruction he has personally witnessed. Among those incidents were numerous fires set by illegal aliens which burned over 100,000 acres in the fragile desert landscape. The following images of illegal immigrant-related environmental destruction can be found on Desert Invasion U.S.
Wildland fires can result from both natural and human causes. Human-caused wildland fires are of particular concern in Arizona–especially within 100 miles of the U.S.-Mexico border because this is a primary area of entry for illegal border crossers and GAO has previously reported that illegal border crossers have been suspected of igniting wildland fires. Over half of the land in the Arizona border region is managed by the federal government–primarily by the Department of Agriculture’s Forest Service and four agencies within the Department of the Interior. These agencies collaborate with state, tribal, and local entities to respond to wildland fires. GAO was asked to examine, for the region, the (1) number, cause, size, and location of wildland fires from 2006 through 2010; (2) economic and environmental effects of human-caused wildland fires burning 10 or more acres; (3) extent to which illegal border crossers were the ignition source of wildland fires on federal lands; and (4) ways in which the presence of illegal border crossers has affected fire suppression activities. GAO reviewed interagency policies and procedures; analyzed wildland fire data; and interviewed federal, tribal, state, and local officials, as well as private citizens. From 2006 through 2010, at least 2,467 wildland fires occurred in the Arizona border region. Of this number, 2,126, or about 86 percent, were caused by human activity.